Since the 1980s, Robert Gibson has been working behind the scenes as an accomplished jazz and orchestral bass player, and as School of Music Director at the University of Maryland. He has also been an active composer. So it is high time he came center stage and we had a chance to hear his own chamber music. Flux and Fire features Gibson s works for stringed instruments that were inspired by poetry. The fluid boundary between music and poetry as art- and to specific poems as inspiration for instrumental music- is a deeply personal one for the composer and is a defining characteristic of much of his music. Some of the poets he draws from include Alain Bosquet, Stanley Kunitz, and Paul Muldoon, while the listener may discern allusions to the music of Debussy and Takemitsu. The title of the double bass quartet Soundings is a reference in part to the nautical term for measuring the depth of water. This term has an obvious connection to the double bass as the deepest sounding string instrument of the orchestra. As a professional bassist, the composer notes that this work is a personal exploration of the instrument that is closest to me in my life as a musician. This recording showcases four members of the National Symphony. Two string quartets are the chronological bookends of this project. The quartets are framed in the album by three versions of Night Music, a solo work commissioned for the Third Triennial Johansen International Competition for Young String Players (2003) and written so that the work is suitable for performance on violin, viola, or cello without any instrument specific editing. 5.0 out of 5 starsQuality listening. 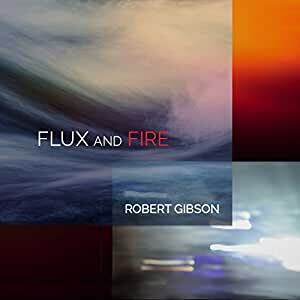 Flux & Fire is a beautiful release by composer Robert Gibson. Gibson, a jazz bassist in addition to being a composer, excels at using his performance background to craft these thoughtful pieces. The pieces are written with a deep knowledge of the instruments, and in a day and age where music is written and consumed quickly, it is definitely worth taking the time to sit and listen to Gibson's work.